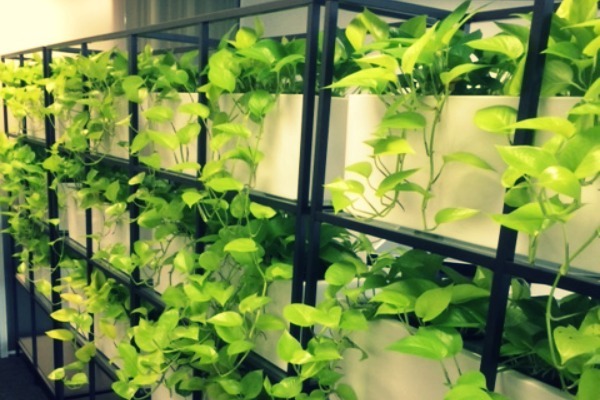 Green Wall for your office - Why Vertical Wall Gardens are the new privacy partition! 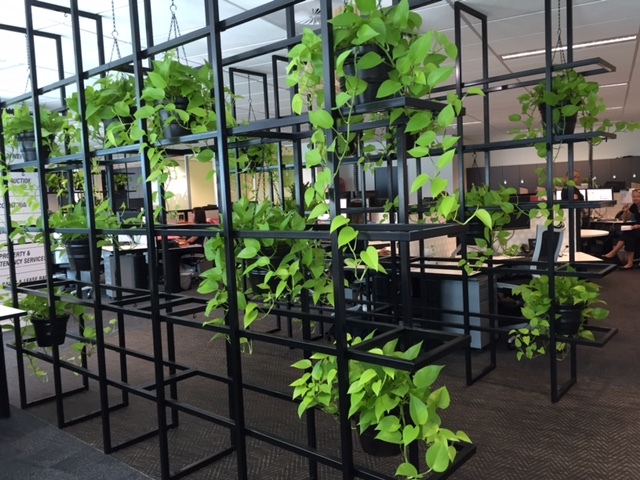 Indoor plant hire is revolutionising the way organisations see the office space. Gone are the days of office workers being trapped in white cubicles, surrounded by more white walls, white ceilings and grey carpets. Why not try a green wall? A growing number of studies seeking to understand the impacts of office space aesthetics and layout on the worker. The phenomenal results of the studies are driving organisational change. Companies of all sizes are adapting to open planned spaces, collaborative desk arrangements and hot desks. All in the name of boosting productivity and worker satisfaction. Alas, large scale office reshuffles are sometimes just not practical. Fear not, because the Trans-Plant indoor plant hire team have to skills and plant selection to optimise any space. What is consistently documented is the positive effects of indoor plants on health and wellbeing. 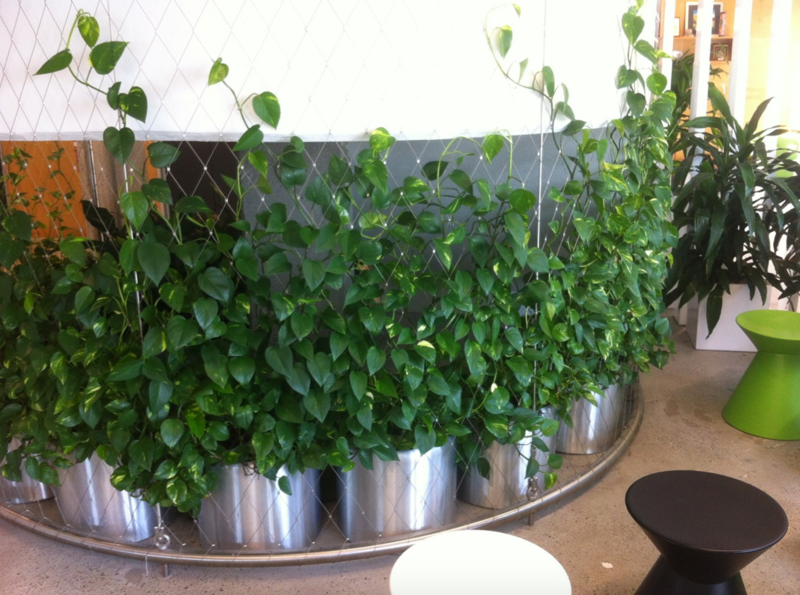 So why not turn those dull partition walls into lush, green walls of beneficial plants? Vertical gardens full of ferns and bushy plants are lush and dreamy, but they’re simply not practical for most office spaces. Your vertical doesn’t have to be extravagant to be effective. 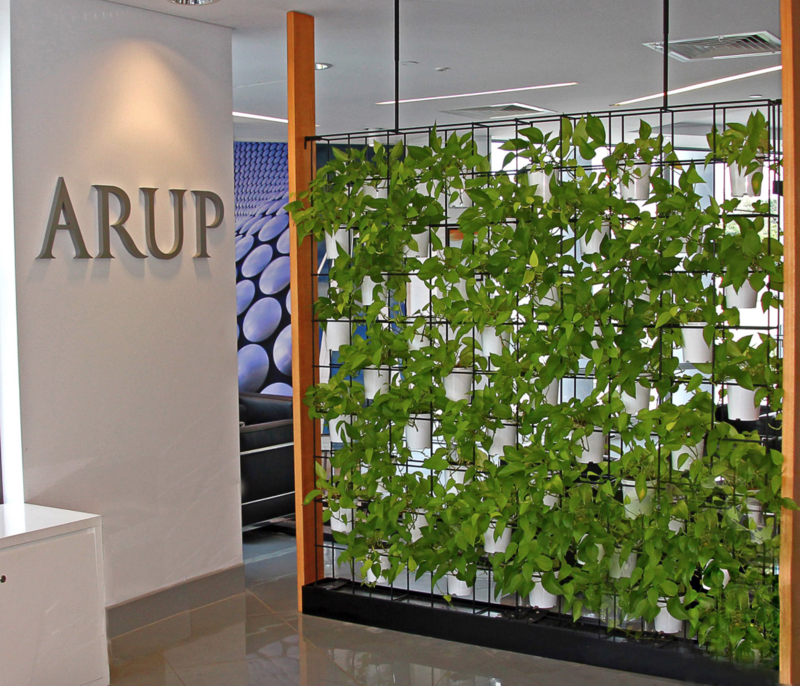 The Trans-Plant free standing structures mean your office can reap the benefits of a lush living wall without the complexity of renovating. Living walls which are built into the walls require extensive remodelling and internal irrigation. Trans-Plant’s free standing structures are a beautiful, cost effective alternative. Here are some simple options that can fit into any space and budget. A living wall of lush green plants reflects and elevates natural and artificial light in a way that only real plants can, achieving not only a fresh feeling but also purified air. The Trans-Plant indoor living free-standing wall is perfect for any office. The minimalist design of our ceiling-to-floor feature is airy in layout as not to overwhelm the space. Likewise, a large space can be filled by increasing the number of plants to make a dense privacy screen. If your organisation is making the change to a modern open plan office, then perhaps you don’t want to dominate the space with a floor to ceiling feature. 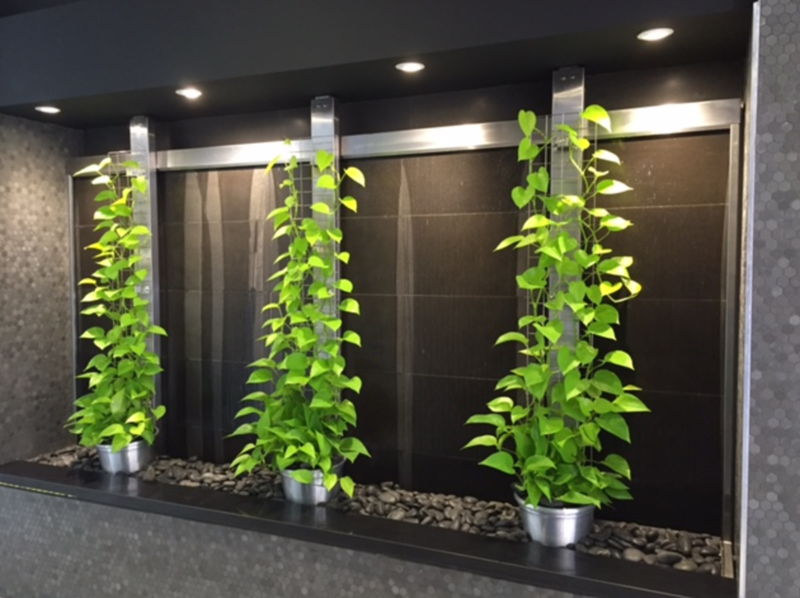 The Trans-Plant indoor plant team can adjust the vertical garden to suit your space. A half wall is a great way to keep the wide open feeling by not interrupting the vision at eye level. Despite their petite height, the gifts that the small wall can give are in no way small. Just like the full feature wall, the greenery lifts the mood through a sprinkling of colour. Plus, because all Trans-Plant plant solutions are real plants your office will relish in the delights of pure air and lower levels of stress. Benefits that only real plants can offer. Vines are wonderful things. Their creeping crawling has this ability to evoke senses of adventure, like Tarzan swinging through the jungle. Vines fill a space in a way that truly emulates nature. Additionally, many offices rave about the way they love to see the vines grow, creeping up walls or slowly spilling further and further over ledges. 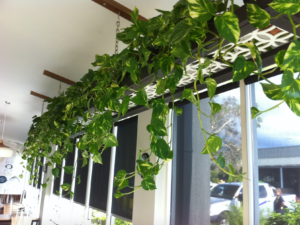 There are a number of vines that adapt superbly to indoor environments. The malleable nature of vines means that they can be placed in all spaces. Here are two of our favourite uses of vines. Vines can be trained to attach to almost any surface in almost any direction. They are beautiful and lush in density and singularity. With one plant having the ability to grow to great lengths. This means your office can exude jungle vibes without having to invest in a number of large pots. Floor-to-ceiling vines lift a space in a bold way without consuming too much space. One of our favourite uses for the crawling vine was in this lobby space. Here we trained the vine to work its way up barely noticeable wire framing that we placed on pre-existing pillars. There’s a feeling which falling vines exude, this sense of unexplored hidden grottos, full of treasure and magic. While we’d probably be pretty hard press to find anyone who thinks their 9-5 office has a sense of treasure and magic, the addition of a few falling vines has been proven to lift moral. The beauty of falling vines is that they take up no floor space at all. They can be scattered around on little ledges above head height and left to ooze magic. Just like our living walls, falling vines capture light in a mystic way that illuminates the room. All of the Trans-Plant indoor plants are selected based on your office’s ecosystem. The plants chosen are specifically suited to the temperature and light within your environment. Our experts will install and nourish your new lush greenery. All you have to do is sit back and enjoy the benefits.